In your endless prison, amongst the thick fog that makes iron bars of tree trunks – you’re lost. You manage to find an old bunker abandoned in what seems like a hurry, but before you have time to dwell on their fate, a blood curdling groan pierces the still air. Snapping your head to its direction you catch a glimpse of an unknown figure shambling through the door. “It can’t be,” you think, but it is. The realisation washes over you. It’s calming – familiar even. Your fears fade, your heart rate slows, it’s just another re-master pushing its way through to release. Phew. Yes, the latest trend of re-releasing past glories shows no sign of abating. Call of Duty Zombies Chronicles is the latest effort by developer Treyarch to inject life into the bloated corpse that is the Call of Duty zombie series. 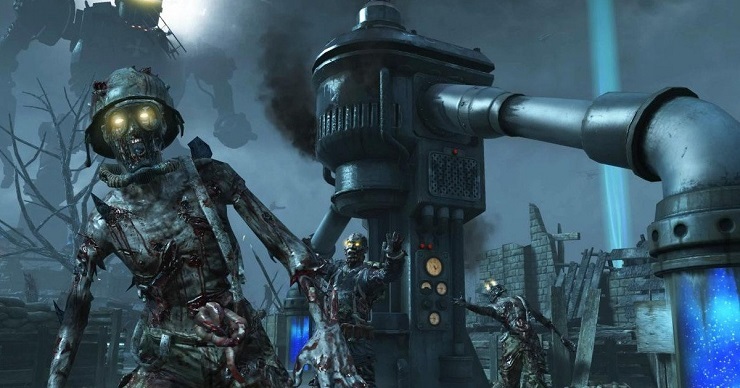 It’s a clever move, as Zombies has long been a selling point for CoD and it only seems natural that they would try and release a sort of compendium; a greatest hits of the series high points and humble beginnings, and humble they were. 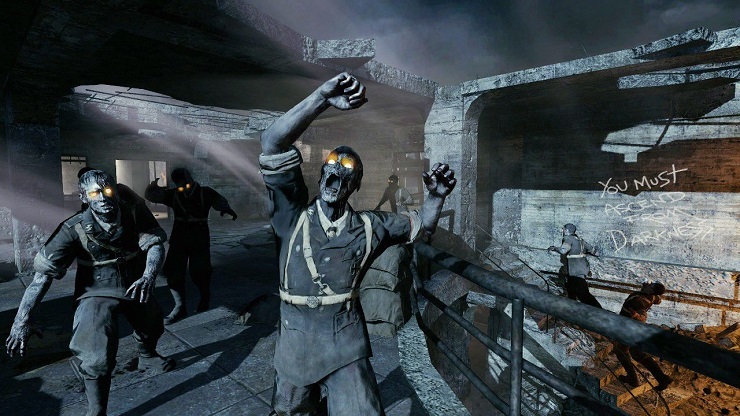 If you have never played any of Call of Duty’s zombie maps before then the premise is simple: you must survive never ending waves of progressively harder zombies. You earn points by landing shots, surviving a wave and barricading entry points. These points can then be used to purchase better weapons, open routes to new areas, operate traps and purchase weapon or personal upgrades. It is often frantic, and for newcomers it will be quite an exhilarating experience getting to know the areas. 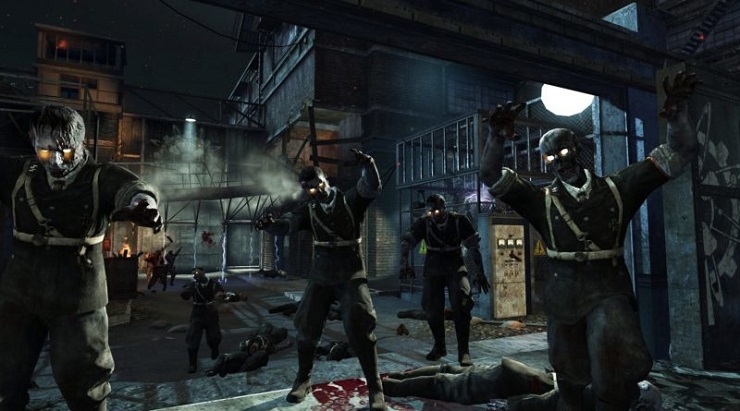 Kicking off with the map that started it all back in 2008, Nacht Der Untoten can almost be considered a tutorial of sorts and it’s a great place to start if you’re new to the zombies game mode. Its small, has only two floors, and has no power switches or traps to turn on. Treyarch has spiced things up by adding in the Gobblegums of Black Ops III, but it does little to really make the map interesting beyond a dozen waves or so. It may be a nice trip down memory lane for some though, as the maps have all received a graphical overhaul and a few rounds of the original map can be fun – but it’s short lived. The repetitive nature of the incessant wave of zombies becomes increasingly apparent on the original World at War maps and it won’t be long before you will find yourself wanting something bigger. It feels bland in comparison to the later efforts, which are more akin to full blown campaign maps, with their sprawling pathways and multi-tiered layout. The maps from the next few iterations of CoD are a much more exciting affair. They also feel fresher and it’s easy to see how they were tailored to suit the emerging gameplay from the series progression, which started to get into the bizarre and wacky, with its own story arc and larger than life hero characters. It adds some much-needed playfulness into the horror of facing off against the hordes of rotting flesh, but it too can grow stale as 90 percent of matches devolve into the same pattern; make lots of points in the first five to ten waves until you can get a great combo of weapons from the random mystery box, then run circles around the zombies whilst chipping away at them or even just straight up ripping through them as a group. The only risk being during relocating or rushing out to grab a max ammo power-up. It’s a shame that you are never really forced to move on to a different area and can be contented to just game the system by camping in one particular space with the challenge reduced to how many rounds of ammunition you have left. Yes there are all the (now ubiquitous) Pack-a-Punch upgrades and player enhancers like the Juggernog drink or Gobblegums, but you normally don’t need them if you have a half decent set of players with you. It’s disappointing too, as some of the best fun comes with using all these enhancements to become a zombie killing beast, destroying hundreds of undead with bursts of unlimited power. Still, when the fun starts it is bloody good fun, the gunplay is Call of Duty’s usual tight quality, using the snap aiming to dispatch foes quickly with satisfying precision. Those heart pounding moments are still there even if they seem fewer and further apart than ever before. Visually it looks fantastic. Treyarch has done great work bringing the graphics up to date. It’s not quite on the same level as Modern Warfare Remastered, but they have still done a stellar job. Adding some lighting flourishes here and there and improving the audio to boot, it all helps build a cohesive experience that feels like it belongs amongst the most recent entries in the CoD Zombies saga. There is also quite a bit of content to chew through, 8 maps in total each with its own distinct flavour of undead targets to annihilate, and barring one or two, are great to re-visit and explore once again – if only for a brief period. Also, most of the maps are filled with secrets and Easter eggs to discover, but unfortunately, unless you are playing with a group of friends it’s rare that you will encounter any, as the meta has developed into a bit of a grind-fest. 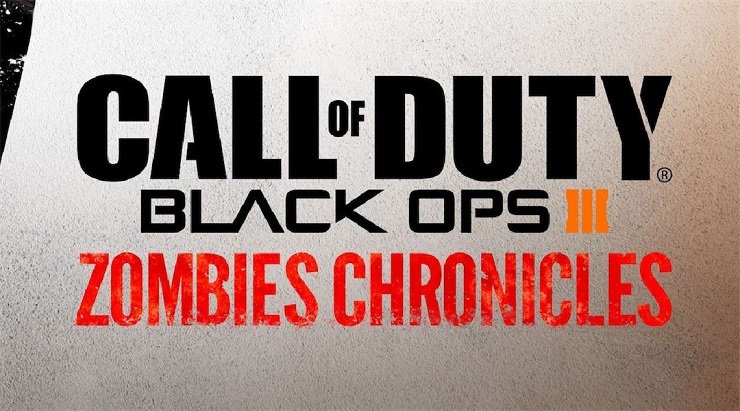 Call of Duty Black Ops III Zombies Chronicles highlights both the best and the worst of the CoD Zombie juggernaut, it shows how far the mode has come, going from a simple fun addition into a massive giant of a pseudo co-op campaign that rivals the main title it ships with. If you’ve never played any of the maps before, then it’s a great place to get stuck in – as long as you have Black Ops III. It’s still great fun after all these years and die-hard fans will no doubt love to jump back into the series classics, but I fear that most will quickly tire of having to put down yet another wave of the undead in one of the maps ‘safe spots’. Despite Treyarch’s efforts to spice things up by jacking-in Black Ops III features, it still ends up feeling repetitive. With some friends, though the mode can be allowed to breathe and when it does it shines brightly still. It would also be fair to say that this feels like it should have been released as a stand-alone expansion rather than a DLC for a game now nearly a year and a half old. It’s not cheap either at £25. It’s probably going to be too steep for some to justify spending that much money on, especially with something that is starting to show its limitations, but if you really love CoD Zombies then this is going to be an essential purchase. Call of Duty: Black Ops III Zombies Chronicles is a great showcase of how a much beloved series has evolved over nearly a decade. It still has some great moments and can still feel fresh and exciting, but those moments cant hold back the slump into grinding repetition most matches end up being.